French high fidelity music streaming service landed in Japan in December 2017. To celebrate the 2018 FIFA World Cup, the service is hosting a Soccer Fever channel until July 16. The channel features song playlists curated by artists from around the world who are representing their country. Kyary Pamyu Pamyu was selected as representing Japan. Playlists include a diverse range of genres from countries across the globe, including French rapper Niksa, Brazilian funk artist Mc Kevinho, German electronic music artist Paul Kalkbrenner, Nigerian afrobeat singer DaVido, and more. The channel also includes top anthems from each country selected by the Deezer editors that people have come to song at World Cup games and tournaments over the past 60 years. Representing Japan, Kyary Pamyu Pamyu curated the playlist “GO JAPAN” in the run up to the World Cup. It features songs by artists such as Ringo Sheena and Ulfuls. English rock band Kasabian are representing England, and their playlist is titled “Come on England!” Their picks feature tracks from artists like James Blake and Giggs, as well as hit songs that scream England. Zara Larsson is representing Sweden, and her playlist “Go Sweden!” includes artists like Tove Lo and Avicii as well as songs that have influenced her as well personal favourites. 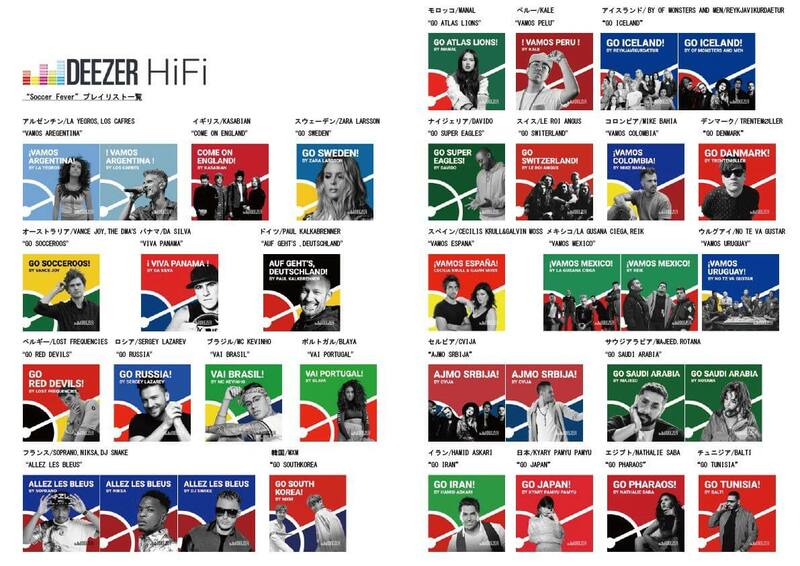 Listen to the playlists created by some of the best artists around the world for this year’s World Cup! *The channel is limited to Deezer users only. The service offers a 1-month free trial.